I had these beautiful fairy tale eggplants and wanted to showcase them in a fabulous meal. I decided to go in a Thai direction since we’ve been eating a lot of Italian food lately. I love Italian food, but variety is the spice of life, as they say. I will go into the recipe, but first a little on the emotional roller coaster that was this meal. The meal consisted of steamed green beans from the farmers market, cubed tofu in a coconut red curry sauce, basmati rice (I know jasmine would have been more authentic, but I use what I have), and fairy tale eggplant sauteed with red onions. Most of the ingredients were organic. It was an impromptu meal without any specific plans other than taking it in a Thai direction. I got the eggplant sauteing with the red onion and wanted to taste for doneness. I cut a little piece and it was so incredibly bitter, I spit it into the compost. I was so disappointed, the whole dish almost went into the compost. Then I decided to pull some Thai red curry paste out of the cupboard to pair with coconut milk for the tofu dish. I tasted the teeniest bit of the curry paste for flavor and it was so hot, I couldnâ€™t taste anything for about twenty minutes. I used about a half tablespoon of the paste with a can of coconut milk, and two pounds of tofu, and (since I couldn’t taste anything but HOT) had to appoint my mother in law as taster to see if it was palatable. Then, as everything was nearly finished, I tasted a green bean for doneness and it was very fibrous, not tender. So, I decided the meal was a disaster and hoped everyone could choke it down. We all put it on our plates without our, now customary, photo shoot. Turns out, the rest of the eggplants were fine, no bitterness. The rest of the green beans were tender and perfectly steamed. The tofu had a great consistency, the coconut milk was creamy and fragrant, and the red curry paste was tasty, well spiced, and not too hot. So, those were the ups and downs, that ended with a delicious meal, and a good photo that my husband scrambled to assemble for me, before it was all gone. 1 lb. or so of fairy tale eggplant cut in half (or cubed eggplant of other varieties). 1 med. red onion diced (great color with the eggplant, but you could use any onion you have on hand). 1-1 & ½ lbs. green beans trimmed and snapped to bite size. While the rice is cooking start searing the cubed tofu in some of the coconut oil on med. and let it sit in the heat of the pan, only moving them around the pan occasionally. It will develop a browned meatier texture if it gets a chance to sear on a couple sides. In another pan saute the onions, and when they become translucent, add eggplant. Depending on the size of your eggplant, it will take approx. 10-15 minutes to cook them. About half way through, add the sweetening, lime and soy sauce and the diced ginger and chili, so the flavors have time to combine, but you don’t burn the ginger and chili. In a cup or bowl, mix the red curry paste with the coconut milk and when the tofu looks nice and browned on a few sides, pour in the coconut milk, curry paste sauce. Let that cook about 5-10 minutes to reduce the coconut milk a little and blend the flavors. Season with soy sauce to your taste depending on the saltiness of the curry paste. When everything is close to being done, steam the green beans 4-6 minutes depending on their size and tenderness. 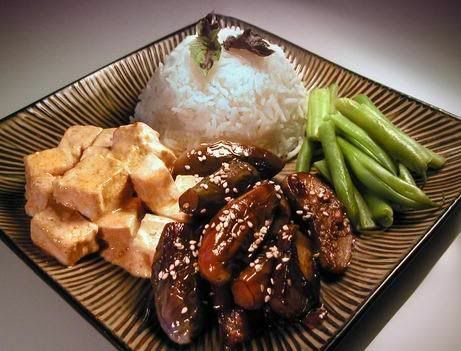 When everything is cooked to perfection, garnish the eggplant with Thai basil or cilantro, and sesame seeds and serve. Your photos are really wonderful and the food on your blog looks delicious! I am going to have a great time looking through the recipes – I have my eye on that polenta medallion recipe!! Thanks Nicisme! Yum, let me know if you make the polenta medallions. They are so easy. with roasted eggplant (pre-roast w/olive oil), potatoes (boil the potatoes a little to give them a head start), zucchini and tomatoes. Cut the eggplant in almost 1/2″ rounds since they “shrink” upon roasting and everything else in kinda thick 1/4″ rounds. Just sprinkle each layer with bread crumbs, parsley, egg, olive oil salt and cheese. A little extra cheese on top and i always use some parmesan mixed with another cheese of the day. Bake covered and then uncovered. Very fresh tasty. Brent – Ooooo, yum. Your casserole idea sounds like a great one. Sounds filling without being overly heavy. I’ll have to try that. Eggplant is such a treat during late summer. We’ve been eating it in some variation a couple times a week. Thanks! Hello – I was surfing the net looking for a recipe for some wonderful fairytale eggplant I got at the farmers market this morning and your site came up. The recipe is just what I was looking for! Something Asian and slightly spicy. I don’t have all the ingredients but I plan to follow your recipe as close as I can. So nice to stumble upon your blog! Hi! Holly ~ Glad you found us! Bri was so creative with her ideas…appreciate having them all recorded here. this is a great post, i loved reading it and you are so cute sharing it all, very much like a fairy tale:)) i totally have similar experiences:) lots of sunshine! Thanks for dropping by BakingFairy. Will come check out your blog, this evening, when I get back from the beach. Love this recipe and this blog. Thanks! And I made this for our sunday dinner tonight–rave reviews. I posted it on my blog! Thanks so much. I am glad it turned out well. Eggplant is one of my all-time favorite foods.